There are several relatable fears for cyber-stalker thrillers to plug into, and an emerging sub-genre of horror films has attempted to capture those anxieties, with varying degrees of success. 2013’s The Den is solid and absolutely terrifying, and last year’s Unfriended was effective to a point though it lost its edge when it lost its grip on the reality it had established. Ratter keeps its story contained to a simple, increasingly uncomfortable case of online prowling that manifests itself in a real, panic-inducing way. At times it feels repetitive (partially be design) with unessential data, even at only 80 minutes, and it leaves several questions unanswered, but Ratter largely works as an exercise portraying feasible escalation of a very real-world threat. Grad student Emma (Ashley Benson) settles into her one bedroom apartment in New York. Giving a tour to her father via Skype, she points out an upstairs loft/storage area that should pique our interest in this type of film. It becomes apparent within the first several minutes that we’re seeing Emma’s life through her connected devices: phone, laptop, Wii, etc. She’s fallen victim to a ratter, a hacker who gains remote control of these things. There are a couple of suspects – an ex-boyfriend from back home with whom Emma has a contentious conversation or two, and Michael (Matt McGorry), a guy at school who lays on the charm pretty thick. As the ratter’s obsession with Emma grows, the metaphysical interactions are no longer enough and physical danger becomes imminent. While voyeurism is nothing new in film, and specifically in the horror/thriller genre, the digital age adds another level of unpleasantness that Ratter presents coldly. With technology on or around our person at any given second, there’s always a chance that someone is watching/reading/lurking. And if that someone takes an interest in us for whatever reason (and is a little bit tech savvy), we could be in trouble. There’s literally nowhere safe. 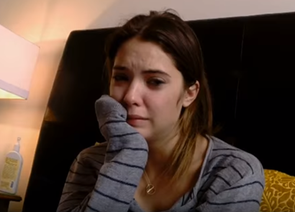 Presented solely through cameras on Emma’s tech – a technique that shouldn’t be confused with found footage – Ratter makes the mundane uncomfortable. When she rides the train, studies in the library, dances in her living room, and falls asleep with her laptop on her belly, he’s watching. Though we know little about Emma other than her school/romantic situation and musical taste, she’s always vulnerable and we connect with her. Benson appropriately underplays her day-to-day, never giving the impression that she’s acting like someone in this situation, and stays even-keel until it’s time to get really, really scared, which happens to be way after we’re already on edge. Writer/director Branden Kramer makes Emma empathetic by having her act appropriately given the evidence of malfeasance. She calls friend Nicole (Rebecca Naomi Jones) when creeped-out by weird messages, takes her computer to a tech guy and follows his advice when files go missing, and calls the cops when there’s a direct warning. Kramer also effectively portrays the growing obsession though the imagery on the devices without having to explain a lot through hokey dialogue. Medium shots of Emma in her living room turn to close-ups of her sleeping or shaving her legs in the bathroom (though she conveniently angles her laptop to peer to the side of the shower curtain in this instance, logistical issues with how the images are captured are minor). Then, there are two feet outside the apartment door in the middle of the night, then an outline on Emma’s balcony, and then a shadow moving in her kitchen in the distance. And so on. There’s some inventiveness with how the escalation of obsession is presented. The ratter rewinds and edits things Emma says to make it appear as though she’s talking directly to him, and he juxtaposes dark images of himself with her. While the growing eeriness is apparent, there’s a bit of an issue with timelines. It sometimes seems as if events are unfolding quickly over a few days, but the progression of Emma and Michael’s relationship and her friendship with Nicole suggest otherwise. At one point the stalker deletes an important message regarding an impending job interview, but there’s no follow-through and that string is left dangling. There’s a lot left dangling in the end, which is abrupt. Those looking for a certain degree of closure may be disappointed, but maybe wanting all of the sordid details cleaned up would make us the creeps. The point of random online peril is well-made and more than enough to unsettle and make us look upon our iPhones with insecurity. At least for a little while.